A Cobra Flash will never replace studio lighting, but here are a few tips and tricks to get the most out of such small and light equipment. As always, I am biased toward gear efficiency for travel and hiking (minimizing size and weight). 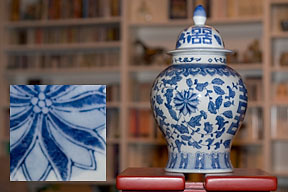 NOTE: The little flash head at the bottom of the images below represents the one attached to the camera hot-shoe. 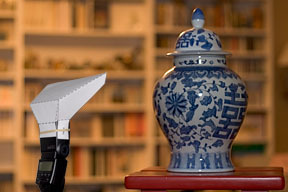 When a remote flash is present, it is shown "floating". 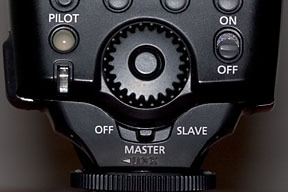 To use a flash as the main light source, you must be in manual mode (M). Manual exposure acts on the background and flash exposure compensation acts on the foreground. Exposure adjustments are always a compromise, but as a general rule: aperture should be set for your desired depth of field, shutter speed should be high enough to avoid motion blur and slower than your flash sync speed to avoid high speed sync for maximum flash power. 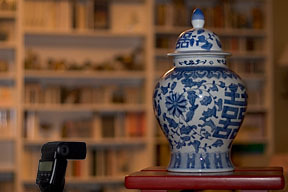 The background will probably be underexposed, but it still is possible to adjust it with the ISO setting. This image was taken at f/2 1/80s and 200 ISO. Rolling your mouse over it will get you at 400 ISO. 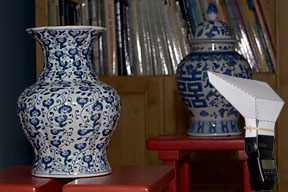 A flash is nearly a point light source which causes harsh shadow transitions. 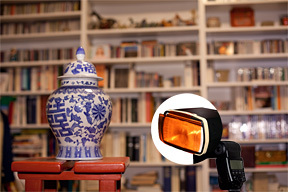 Using a reflecting diffuser similar to the Lumiquest Pocket Bouncer will soften those transitions. Personally, I use a homemade one which folds flat for easy and painless transportation. But then, above about 3 meters (10 feet) such a small diffusion is useless and only accelerates battery drain. Rolling your mouse above this image taken with direct flash will add a diffuser. 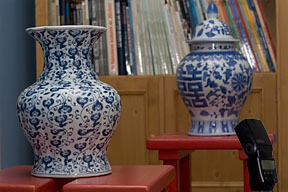 Using a white wall or ceiling as a huge diffuser, leads to a more consistent lighting for multi-layer compositions (several people for instance). Unless your subjects are positioned around your flash on a circular arc, direct flash will create exposure gradations that will quickly be unacceptable depending on subject distances. Rolling you mouse over this image taken with reflecting diffuser will move to bouncing the flash on the white ceiling. Indoors, we are used to ceiling lights which create shadows under eyebrows and chins… This is also very visible when using a white ceiling as a diffuser, but can be greatly softened by a simple white card attached to the flash by a rubber band which bounces part of the light to soften shadows (some sort of manual fill-in). 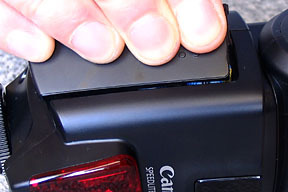 The 580EX flash has such a (small) pull-out card. The amount of fill-in is adjusted by the size of the card and the bouncing angle; 60° seems to be often the right compromise. 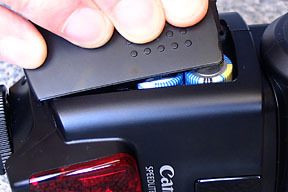 Plastic translucent caps are frequently used for similar results, but with the inconvenience of greatly draining batteries, as much light is absorbed and scattered by the contraption. 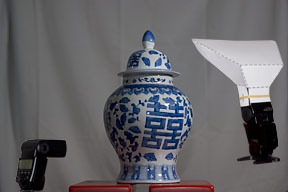 In smaller rooms, the 14mm 580EX diffuser can also be lowered to project some light on ceiling and walls. Beyond a few meters (about 10 feet), the fill-in effect quickly becomes negligible and I then use multi-flash when possible (see below). 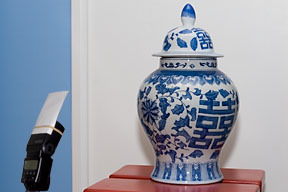 Rolling your mouse on this image taken with flash bounced on the white ceiling will add a white card to soften shadows. 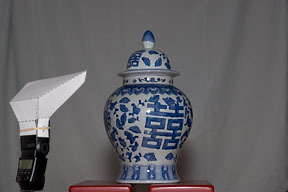 In a large room, the flash will be of no help to light up the background. 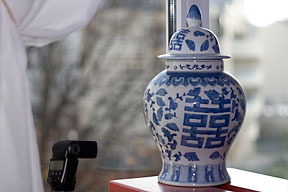 To improve the scene's atmosphere, shutter speed can be lowered below usual hand holding limits to expose the background at about -1 EV (M manual mode). A slight motion blur of the background will have no visual impact; and the foreground subject will still be sharp, freezed by the flash. For a more natural look, you can use second curtain sync when part of the subject is moving (an arm for instance). 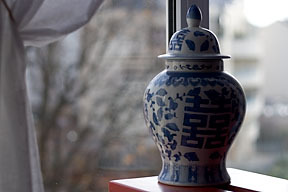 This photo was taken at 50mm on an EOS 20D at 1/80s. 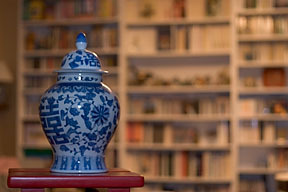 Rolling your mouse will reveal the same photo taken without a tripod at 1/30s: the subject detail remains sharp. When your composition contains a flashed foreground and an artificially lit background, choosing the white balance mode is a headache! Likewise when the flash is bounced on a ceiling that is not perfectly white... A good compromise is probably to use Auto White Balance (AWB). 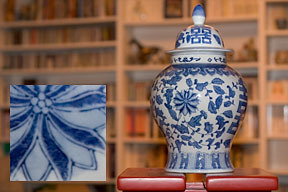 Nevertheless, the most effective technique remains to adjust white balance under Photoshop CameraRAW to the desired / remembered color temperature. Rolling your mouse over this image taken in flash white balance mode will reveal a version adjusted under Photoshop CameraRAW to a better color temperature balance. An even better solution to balance an artificially lit background is to use a flash head filter adapted to the background color temperature. The inconvenience is a heavier drain on the flash batteries though. Canon don't propose such filters, so I bought Nikon SJ-3 filters that I fix with a rubber band. Two types of filters in two different strengths are available for tungsten (yellow) and fluorescent (green) lights. Auto white balance won't work any more, so don't forget to select white balance according to the background lighting. Rolling your mouse over this image taken in auto white balance mode will reveal a tungsten filter version with tungsten white balance. The drawback of single-flash lighting is the lack of modeling control. Without going into studio lighting, I readily use my 420EX (B) with diffusion as the mobile main flash and the 580EX (A) on the hot-shoe as direct fill-flash and 420EX pilot. Many lighting options are possible, but for a portrait, you can start with B slightly above the eyes at 2 m (7 feet) and an angle of 45° to the nose of the subject. 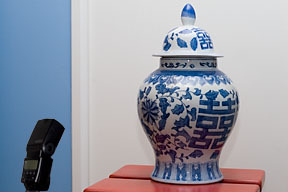 I do not use a diffuser with A, as it only has a fill-flash purpose to soften shadows created by B. Furthermore, as pilot, it sets itself in wide-angle mode to send instructions to distant slaves: power should not be wasted. 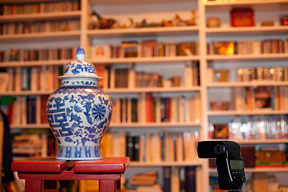 For group photos (around a table for instance), B set on top of some piece of furniture and pointed towards a white ceiling will lead to a very homogeneous lighting. As for the (A:B) ratio, it lets you adjust shadow softening. For instance: barely visible shadows (1:2) for women and children, visible shadows (1:3) for men and still life, or very little shadow details (1:4) for elderly people. Rolling you mouse over this image taken with reflecting diffuser will move to 45° multi-flash with a (1:3) ratio. Despite the 580EX II many new features, I chose to buy the older 580EX flash for a feature that was essential to me. In those conditions where I use multi-flash (family events and remote flash on a tripod), I wish to switch to mono-flash mode very quickly to capture unexpected actions not covered by the remote flash. The 580EX has an OFF-MASTER flip-switch, on the 580EX II this is set through menus. The 580EX instruction manual tells you to slide and open the battery compartment cover, which is very difficult… Adding an intermediate step by slightly pulling the door leads to a much safer opening final step!